I like watching science documentaries and this one is definitely the best. The reason is, I think, the subject matter. "Why we're here?" "Where did we come from?" These are profoundly deep and fascinating questions. Fortunately, modern science can offer the most rational answers to them, emancipating us from irrational ancient mysticism. Why this series is so successful in capturing our imagination? 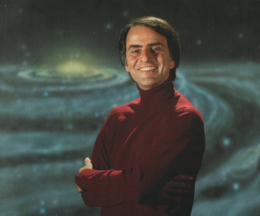 I believe that's because of Carl Sagan. His voice, and the way he speaks to us, is really captivating. I can't think of anyone better than him as a presenter of science documentaries. And his prose is just majestic. I can clearly see how much Richard Dawkins, another favourite of mine, is influenced by his writing. Well over 13 hours of sheer delight.